Always Dancing To Someone Else's Tune? Hi, my name is Sandee Lembke. In an online Harris poll, it was found that 72% of adults in the United States are seriously thinking about starting a home-based business. Having worked full time Corporate-America-Very-Demanding jobs while trying to raise a family, I can personally understand why so many people consider working from home a worthy dream to have. In many ways, the Internet has leveled the playing field and made it possible for people of all walks of life to finally have a real shot at creating a successful home-based business. BUT A WORD OF CAUTION: I am sure you are aware of several get-rich-quick schemes that promise work from home internet opportunities and overnight success. Unfortunately, I was seduced by a couple of these so called solutions and lost some of my hard earned cash in the process. The good news is that I have become quite adept at recognizing crap when I see it and I can tell you that the ECourse offered below is NOT crap. You will see what I mean when you get the first lesson. If you are considering starting an at-home internet business, I am confident that you will find these lessons timely and very informative just as I did. Or if you have already started your internet business and have not seen the results you were hoping for, take a time out and read these lessons. They may be just what you need to get things moving in the right direction. Complete the BLUE BOX below and you will receive one lesson per day for the next 3 days. This Masters Course For Moms was written by 4 WAHMs (work at home Moms). Each Mom is building a profitable online business by providing quality information about a subject or theme that she knows and feels passionate about. Follow their stories step by step as they share how they are doing it. "I don't know of any report anywhere which does a better job of explaining how to succeed in affiliate marketing - and you don't have to pay a cent for it." 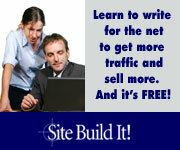 It will teach you how to develop your site concept, brainstorm keywords, build a profitable web site and attract targeted, motivated traffic. A great informational guide. Many books can be found that teach people how to write sales copy, but if you want to have a successful internet business you need to learn the concept of preselling, or warming up your visitors, before trying to sell them anything. The Netwriting Masters Course covers the entire process from attracting visitors to preselling, and ultimately. converting them into buyers.